The SPARS, like the WAVES, turned to higher education for their leader. Dorothy Stratton was the first full time Dean of Women at Purdue University as World War II started. She left higher education to join the service, become a member of the first WAVES’ officer class at Smith College. She was then assigned as Assistant to the Commanding Officer of the WAVES radio training program at the University of Wisconsin, Madison. 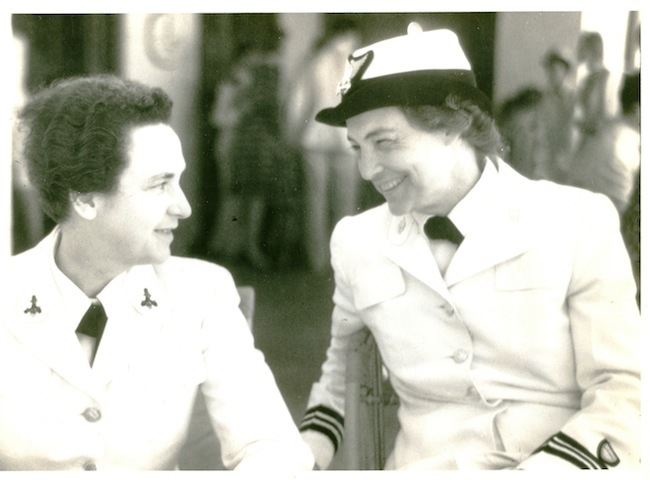 This photograph of Stratton and WAVES commander Mildred McAfee comes from the U.S. Coast Guard. A fabulous woman and at the right time, it appears. She had a distinguished career and lived to be 106 at the same time? Wow!